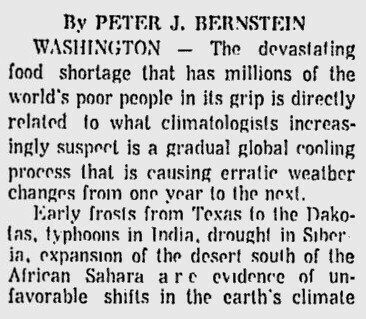 Now they tell us that global warming is causing food shortages. This entry was posted in On The Safe Side Of 350. Bookmark the permalink. 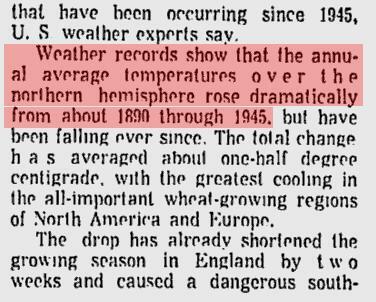 Steve you need to highlight the bit that says Ts rose DRAMATICALLY between 1890 and 1945. The current rise must be DOUBLE DRAMATIC then. Ok. So when are you going to appear before Congress with all this stuff from your blog? While you’re being compliant with wishes, is there any way you can catalog or categorize this stuff? You’re so prolific in posting articles, often when I want to refer to a past article, it takes me considerable time to find and often the person I want to antagonize with it has moved on. These historic news clippings especially. 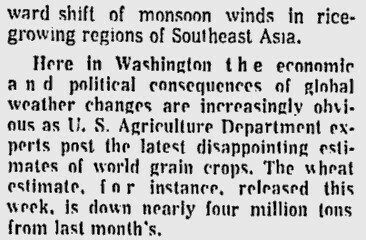 In late September 1974, there were large US crop losses due to an unusually cold August followed by severe early frosts in late September. The futures market for corn had 6 straight “limit up” days.